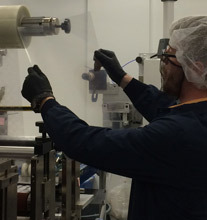 Optically clear adhesives or OCA films are a popular material used in the medical device and electronics markets for screen bonding. This material bonds the cover lens, plastic, or other optical materials to the main sensor unit on a device. Unlike other bonding adhesives, optically clear adhesive is completely transparent and clear colored. This allows the entire surface area of a screen to bond to the device without any haze or distortion to the graphics display. Optically Clear Adhesives are used to bond touch screens, LCD flat panel displays, transparent graphic overlays and other devices that require a transparent bond. For electronics screen bonding it is crucial to use tight tolerance die cut pieces to ensure the device does not have excess adhesive or contaminants around the perimeter of the device. This helps to create the strongest possible bond while minimizing the weight of the adhesive used in the device. Strouse die cuts optically clear adhesive to custom sizes, shapes, and formats. We can provide you products in the form of custom width rolls of tape or custom cut parts on a roll, on a sheet of material, or as individual pieces. If you have a question about a project you are working on or think using OCA films or pressure sensitive adhesive can bring your product to market faster, contact us today! ARE YOU SOURCING CONVERTED ADHESIVE? 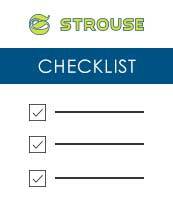 Download our Checklist to Choosing an Adhesive Converter. This will help you understand the most important aspects when choosing a converter to partner with.